Blue Switch Consulting - Blog - Who's Doing the Office Housework? And those few people are often women. A woman’s tendency to overcontribute to the domestic labour in the workplace rolls over from the fact she does the same at home. In Canada, women spend 133 minutes per day on routine housework, compared with 83 minutes for men. Women, when asked, don’t always realize they’re playing the “office mom,” and when they do, they often say they don’t mind. HAVE YOU BEEN DOING THE OFFICE HOUSEWORK? Do you organize company events? Do you head up a committee for this or that? Do you save the day when the printer is out of paper or reboot the finicky A/V before the meeting? Do you take notes on the whiteboard during brainstorming sessions? If you’ve been doing these tasks, and they don’t fall under your job description, then chances are, you’ve been doing office housework. The effect of the division of domestic labour in the workplace don’t begin and end with the female employee spending a few more minutes putting dishes away. Women are conditioned to be helpers from a young age, and so often derive an internal sense of pleasure when we’ve tidied up, or made someone’s day easier, or taken responsibility off someone else’s plate. These behaviors are altruistic, and should be performed by all people, but in the context of the workplace, this altruism can negatively impact a woman’s career. The irony is, performing the office housework doesn’t earn a female professional any gold stars. In fact, when men do the same office housework as women, they are more likely to be recommended for promotions, important projects, raises and bonuses. There is no equivalent payoff for women. This feedback loop illustrates how actions are both motivated by - and motivate - perceptions about gender roles. 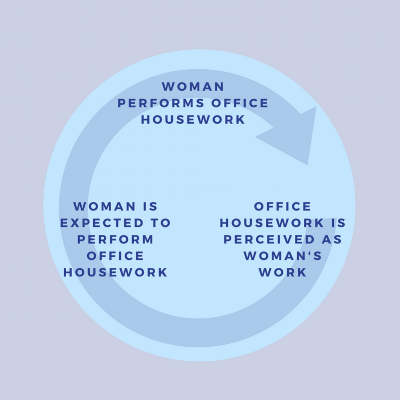 When women are expected to do the office housework, that “extra” actually becomes their baseline. The same isn’t true for men. So, when a male colleague declines to take on extra work, no one much cares. However, when women decline to do the “extra,” they are penalized: they receive worse performance evaluations, fewer recommendations for promotions, and are considered less likeable by their peers. If you run to the copy room for extra handouts before the meeting, you aren’t sitting around the table to build rapport with the client. If you’re recording ideas on the whiteboard, you’re less likely to be contributing them. There are some strategies you can use to hack the workplace system that has you doing the chores. When you find yourself in a situation when you’re liable to be put in charge of a low-value task, you can dodge it by pointing out your immediate obligation, or use the power of delegation to deflect the task to someone whose job description better suits it. If you can’t dodge or delegate the office housework being assigned to you, track the time you’re spending on it. If the question of your contribution to a team project or your dedication to your work is ever questioned, you will have a record of the “extra” hours you’ve been working on other value-add tasks. Research shows, men are more likely to toot their own horn when it comes to helping out. They tend to make sure they are caught in the act, while women work behind the scenes. Flip the script and do the work in a visible area. If you’re doing tasks that could be systematised, do it. Create a roster or a spreadsheet that ensures, for example, the role of “whiteboard idea recorder” is one that falls equally on all participants, not disproportionately on the female talent. You can try pointing out the fact that women perform more domestic duties in the workplace, and that you’re not interested in perpetuating an already inequitable scenario. We don’t do ourselves any favors when we raise our hands and volunteer for extra work. Research shows, for example, that female university faculty members are more likely to serve on an administrative committee when asked, compared with their male colleagues. This work is important, no doubt, but does not necessarily contribute favourably to tenure considerations. In his New York Times Bestseller, The Power of Habit: Why We Do What We Do In Life and Business, Charles Duhigg discusses the way we can dismantle a bad habit. Duhigg explains that habits are made of three components: a cue, a behaviour and a reward. It's time to hang up the apron.